Union Pacific Railroad reopened both tracks near the Cortaro Crossing Thursday afternoon following a Tuesday derailment. Following Tuesday afternoon's derailment, Union Pacific has re-opened both main lines for train traffic. 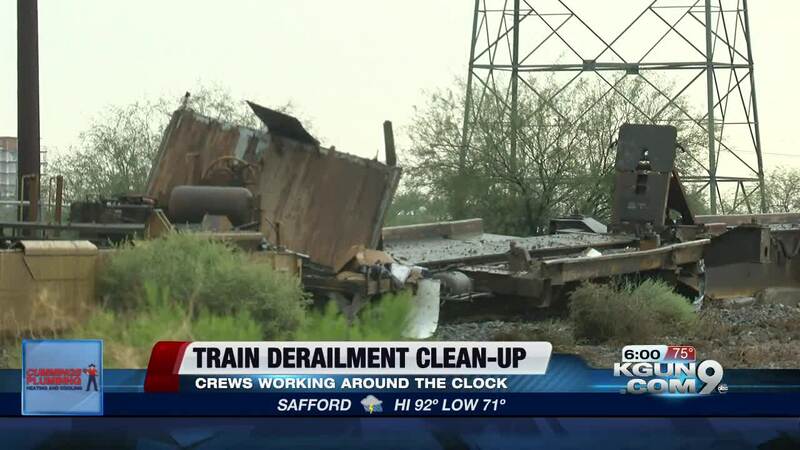 UP crews and contractors worked diligently and safely to clear equipment from the track and make the necessary repairs in order to resume train operations through the area. Work at the site will continue as we move containers and their contents either back onto rail cars or to trucks for transport. Additional clearing and cleaning of the site will be completed as well. While this work continues, the frontage road will remain closed to vehicle traffic. We continue to coordinate with ADOT to determine when to reopen this roadway. 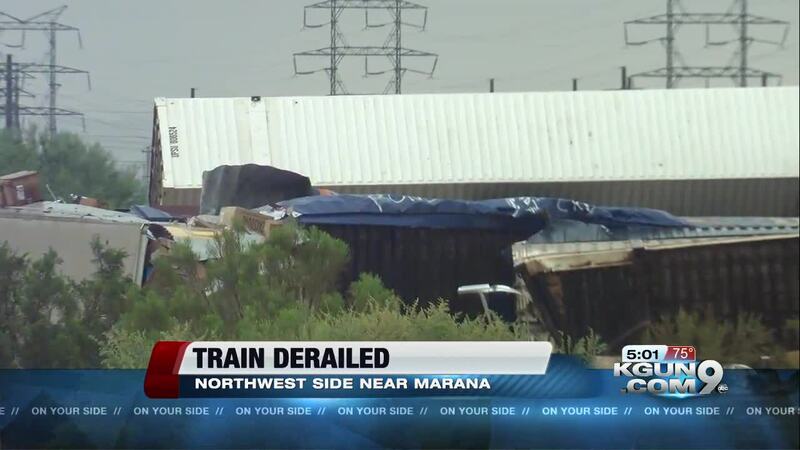 Union Pacific is extremely appreciative of the assistance offered by local first responders during this incident, and of the patience shown by the Marana community as we continue to clear the area. We ask that drivers continue to be alert and safe while driving in the vicinity. The cause for the derailment has not been formally released at this time. 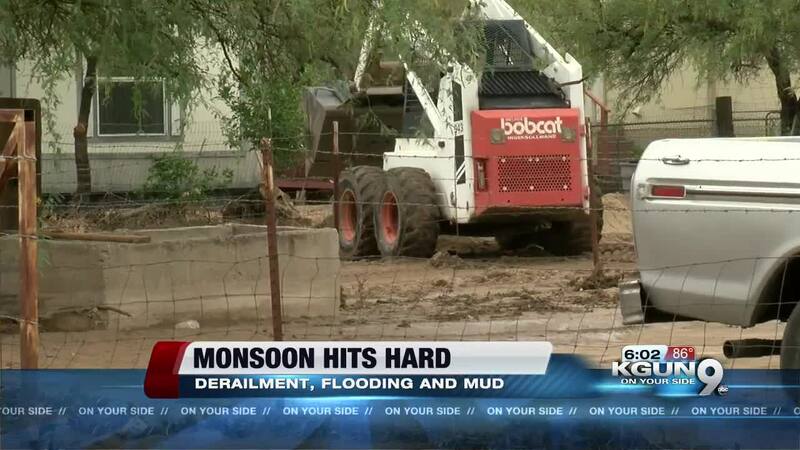 There's a lot of recovery required in a fairly small area socked hard by Tuesday's monsoon. People there are coping with a train derailment, a flooded pet shelter and plenty of mud. There is so much clean up activity at the derailment site it’s a little bit hard to get a view of the derailment itself. But you can get an idea of the main cargo of the cars that went off the rails. There are UPS truck trailers torn open by the impact. 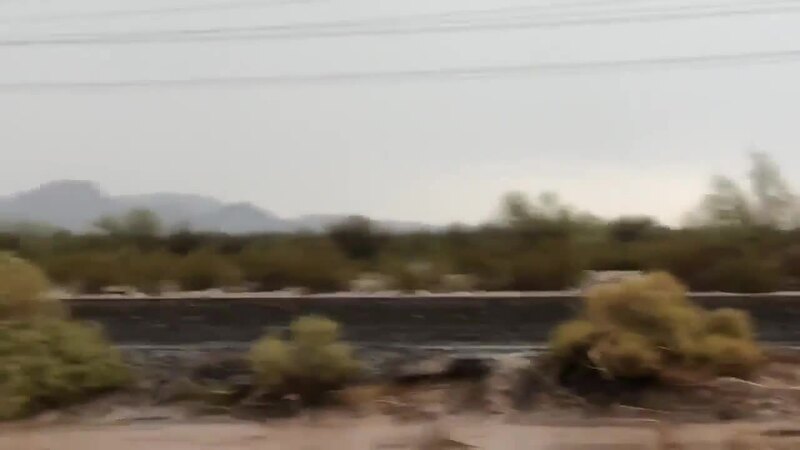 The derailment closed the I-10 access road westbound, just north of Twin Peaks Road. By early morning trains were running again on one of the two tracks. This is a critical section of track for east-west traffic in the U.S.. It also carries supplies to factories in Mexico which send finished goods back north. 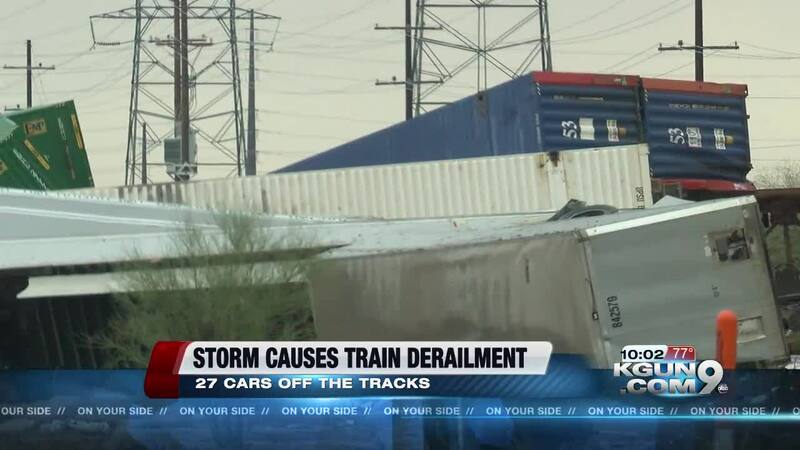 The train was headed from Los Angeles to Texas. 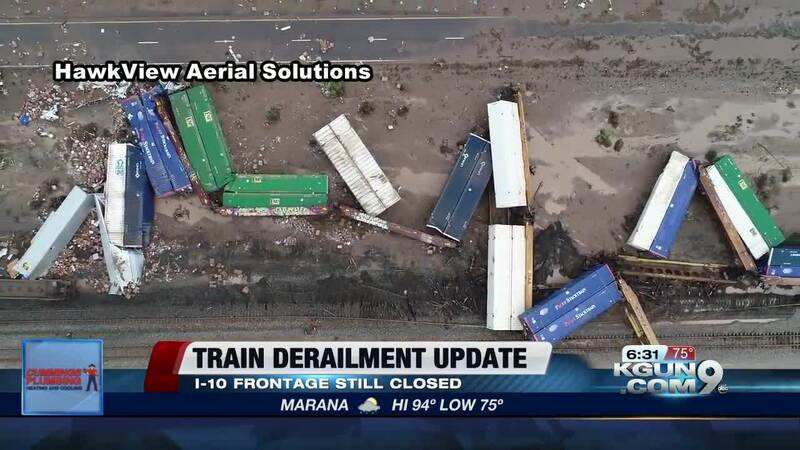 UPS says it will inform customers if the derailment affected their package shipments. 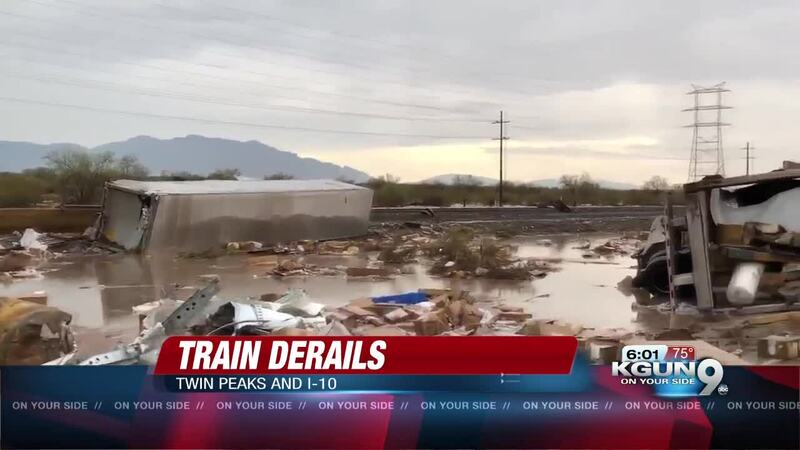 The derailment hit as monsoon hit the area especially hard. Water got so high in a nearby neighborhood, some people used an old fashioned method with a twist, not horse and buggy, but horse and boat. 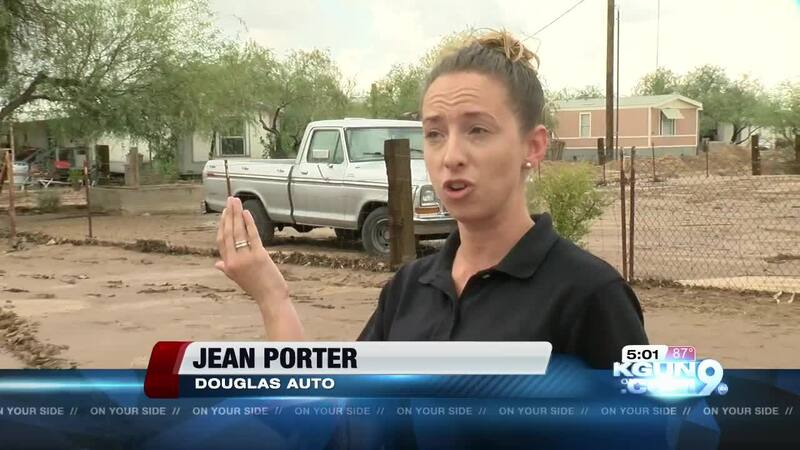 Jean Porter took that video from near Douglas Auto, her family's car repair business. “It saturated and just kept coming down. We had trash trucks that kept trying to pick up. We had trash cans that were floating away. It was a mess, people were trying to get their cars and they couldn't make it so we had a lot of people that were stranded." Thick mud on Joplin road isolated the HOPE animal shelter. At the peak of the storm the shelter flooded with 85 cats and dogs there. Shelter founder Susan Scherl says, ‘You know they get stressed and for cats to be in water,” she laughed, “But we do have a lot of cats that were street cats so that one picture that I sent of the cat sitting up on a scratching post was a feral cat. She knew how to get to the high ground."